Today’s walk took me to Covent Garden. This is an area crammed with interesting things so my use of the relatively obscure Floral Street as a reference might seem odd. The reason is simply that of sentimental attachment (I often walked down Floral Street when I worked in the bookshop) though it does contain a few points of interest. 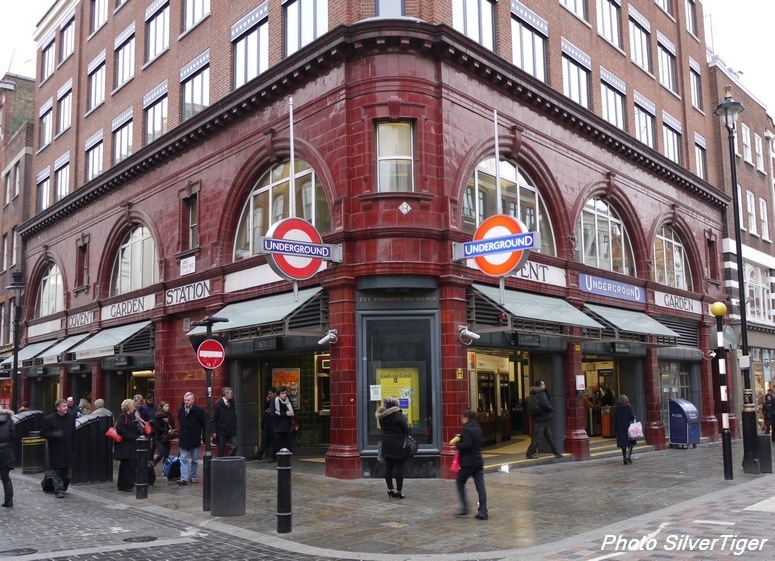 I think the best way to go to Covent Garden is by tube, getting out at Covent Garden station. 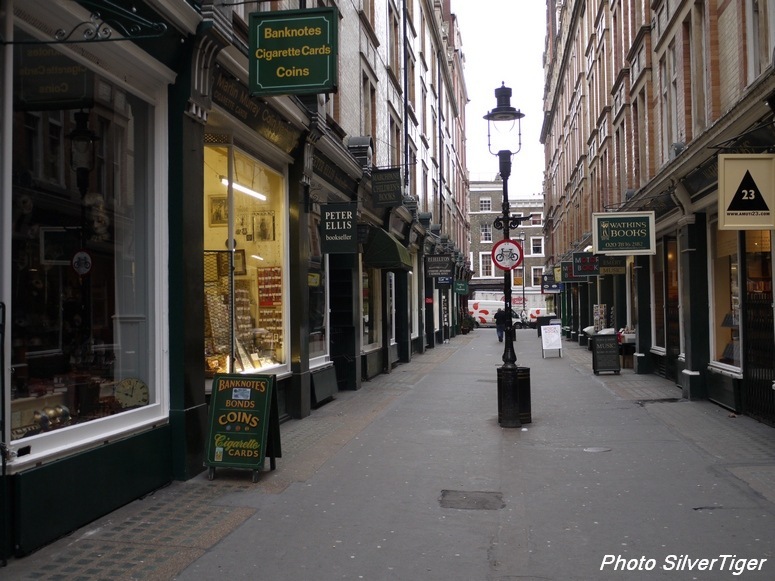 From there, you can walk down James Street to the “Piazza”, the old Covent Garden fruit and vegetable market. Cecil Court is the more interesting of the two, being full of dealers in books, prints, stamps, coins and all sorts of old things. Here you will find Watkins, famous purveyors of woo-woo books, and Motor Books, a magnet for motor enthusiasts. 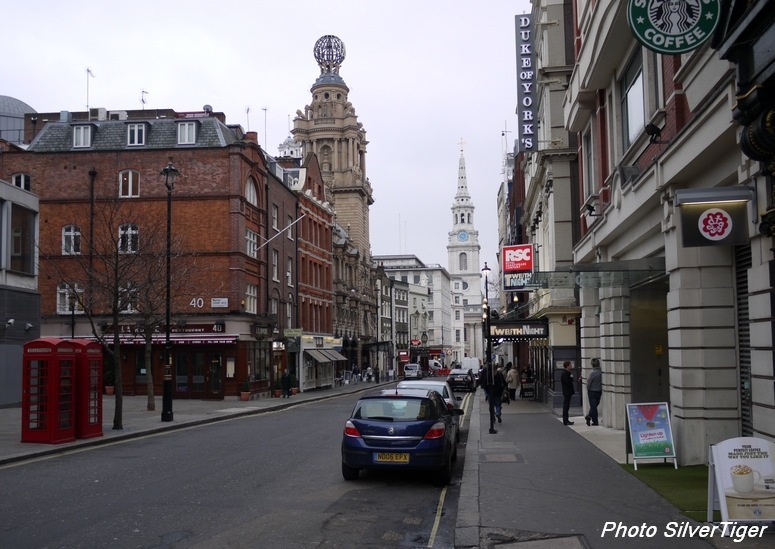 In the picture (right) the two towers belong to the London Coliseum (the one with the globe) and the Church of St Martin in the Fields in Trafalgar Square. 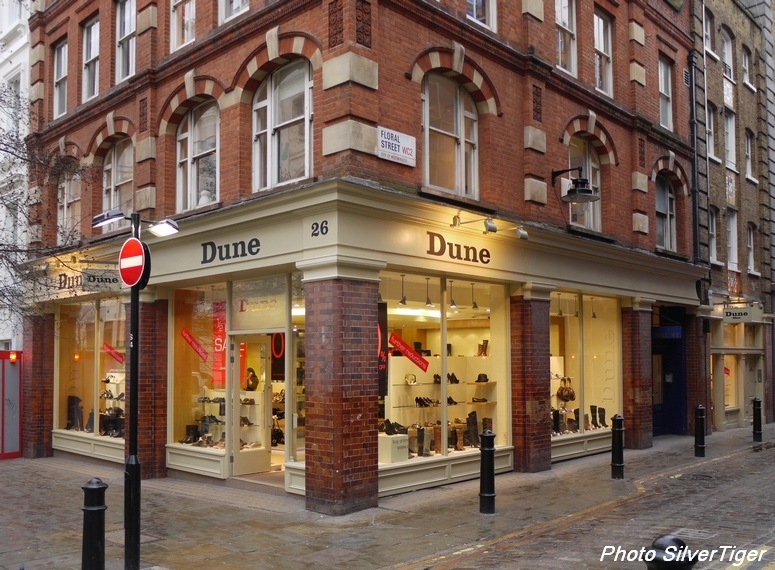 I once applied for a job with a rare book dealer in Cecil Court. I was called for interview but heard nothing further. I wonder what it was that I said? 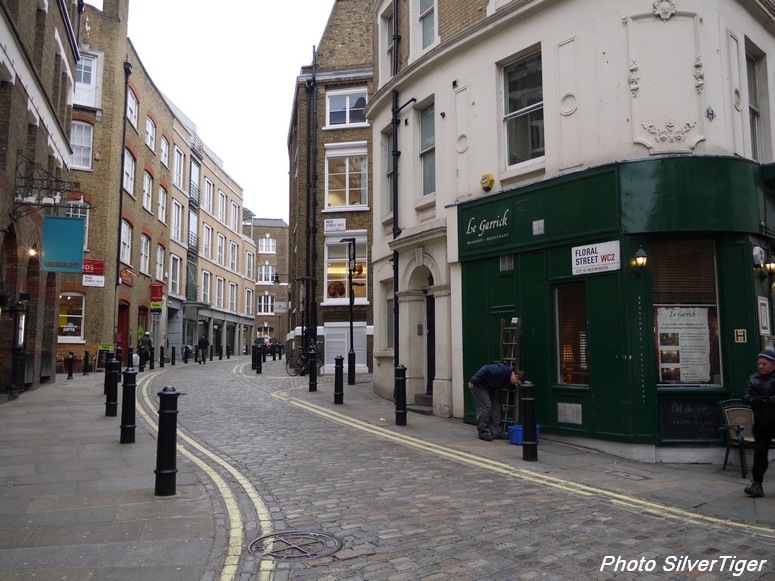 Floral Street starts (or ends) in Garrick Street and runs more or less parallel to the much busier Long Acre. The green building now called “Le Garrick” used to be the late lamented Dillon’s Art Shop. On the next corner on the left, you can just see the rear of Stanfords, the justly famous map and travel book shop. Further along, you come to the Carriage Hall, an open yard today surrounded by shops and offices. I don’t yet know its history but will endeavour to find it out. 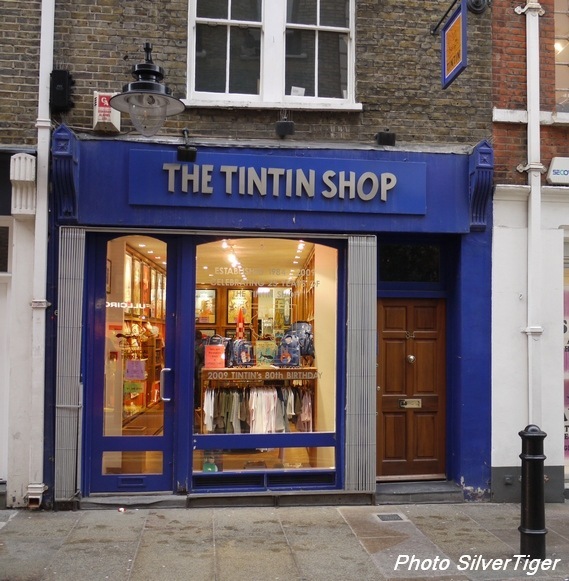 Hergé enthusiasts may be interested in the TinTin shop where you can find everything you need to do with the young Belgian detective and adventurer. And so we come to where I used to work in Covent Garden, though in my day it was a bookshop, a branch of the Books etc chain. Bought out by Borders, the remaining outlets of Books etc sank recently with the mother ship. The shop’s Floral Street door has disappeared. Near it was the till which was my favourite place to work in the shop. 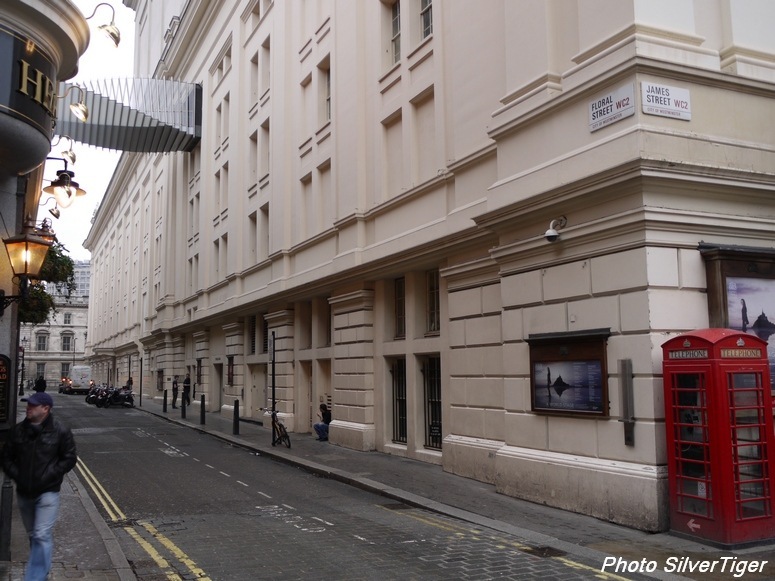 Crossing James Street, Floral Street continues along the side of the The Royal Opera House. Also here is Bertorelli’s Italian restaurant. I cannot say I have been to either establishment. Also nearby is the renowned Theatre Royal Drury Lane which isn’t actually in Drury Lane (though it backs onto it), a source of confusion for visitors from outside London. 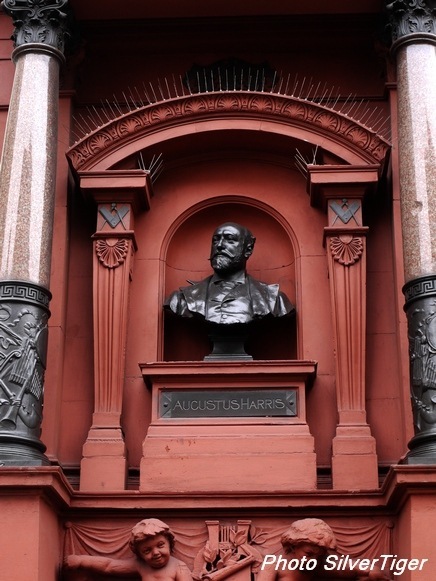 At one end of the theatre’s façade is a drinking fountain, erected by public subscription in honour of Augustus Harris, actor, dramatist, impresario, “father of the pantomime” and one-time director of the Theatre Royal. There is so much to see in this area that a short account necessarily leaves out far more than it includes, especially a quirky personal account such as this one. On the other hand, that leaves material for another time! 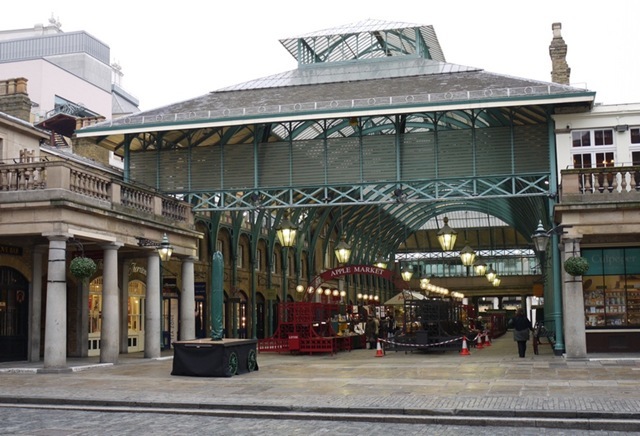 I suppose I can’t really talk about Covent Garden without including a picture of the old market building itself. The above photo shows one of the main halls of the market building, taken from the courtyard between the market and St Paul’s Church. 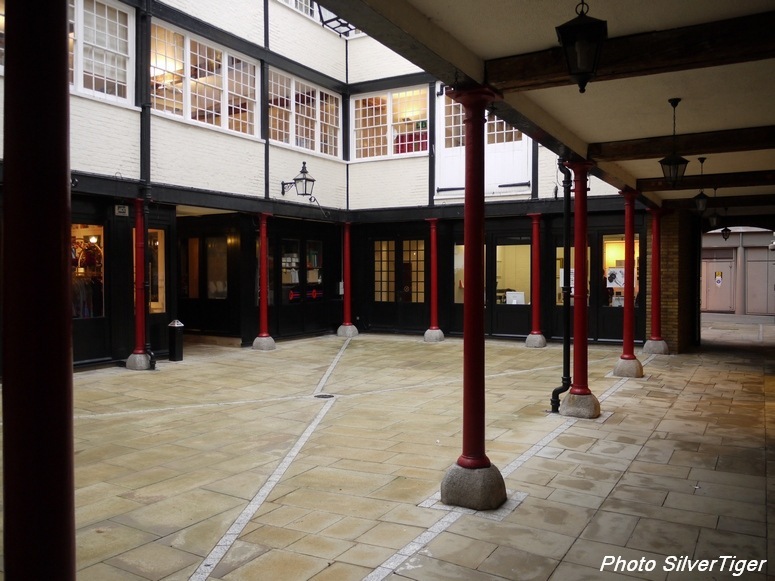 This courtyard provides a stage for buskers and street performers during the summer months. Today, in view of the weather and the relatively early hour, the hall was quiet and the courtyard deserted. In fact, it was cold enough to make my fingers painful when operating the camera and the fitful rain was making photography difficult, so I decided to head for home and warm up with coffee and lunch! For more information on Enzo Plazzotta and his sculpture, please see the interesting comment by Kieran below. 1I do note, however, that the sculpture was “unveiled” in 1988, that Enzo Plazzotta died in 1981; and that even today the Plazzotta Company has unsold works of his. 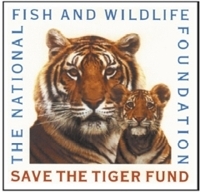 I live in Islington with my partner, "Tigger". I blog about our life and our travels, using my own photos for illustration. This entry was posted in Out and About and tagged Covent Garden, Floral Street. Bookmark the permalink. 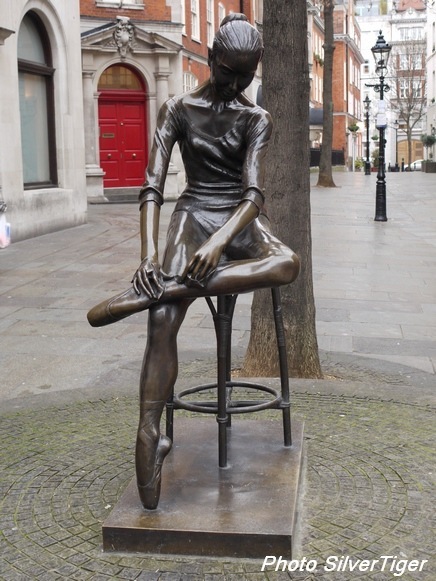 The Young Dancer by Enzo Plazzotta sits opposite the Royal Opera House which is the home of the Royal Ballet, not just the Royal Opera. Plazzotta first came to live in London in 1947, after WWII, when he was decorated while fighting for his native Italy in North Africa and was then active in the Resistance. His health was badly affected by jumping out of speeding trains twice to escape deportation to Germany. He only took up sculpture at age 40, but produced an impressive amount of work in a short time. You can see his energetic male dancer, Jeté, on Millbank, near Tate Britain, and a larger-than-life Leonard ‘windmill’ man in the gardens at Belgrave Square. Jeté was modelled on the David Wall, now Ballet Master at English National Ballet. The Young Dancer may be a tribute to Irish-born Dame Ninette de Valois, founder of the company at Sadlers Wells that later evolved into the Royal Ballet. Since casts may continue to be made from completed work, new and therefore ‘unsold’ work by dead sculptors can always appear on the market. Studio assistants also routinely complete work, including the the ‘Leonardo’ which was finished after Plazzotta’s death from cancer. Thanks very much for this interesting information. I will add an update to the article drawing attention to it. The Thylacine Research Unit - T.R.U.